Ok, we’re a day late so today is technically the seis de mayo rather than cinco de mayo, but let’s celebrate anyway with a Mexican recipe! Ai yai! These chicken enchiladas are adapted from a recipe of a similar ilk over at Simply Recipes, but mine involve more cheese, because come on… everything is better with more cheese! In the process, they are probably less authentic, but given the yum factor, I think all of you can deal with it. These enchiladas take a little bit of prep time, but there’s no real reason why you couldn’t get the whole thing put together in 30 minutes if you really wanted to (you might just slightly singe your fingers if you don’t let the chicken cool sufficiently before shredding). Let’s get to it! Ingredients (I made this for the two of us, but we had enough for one leftover lunch) • 1 jar of salsa verde (you could make the sauce from scratch if you can get your hands on fresh tomatillos, but it’s more work, and I think using the stuff in a jar is perfectly acceptable!) • ½ cup of chopped white/yellow onion • 2 chicken quarters, cooked, skinned, and shredded (I believe a chicken quarter purchased from the supermarket gives you a drumstick attached to a thigh, perhaps with some back → read: plenty of chicken) • 1 clove of garlic, cut into quarters • ¼ of a whole white/yellow onion • 1 tsp of salt • 1/3 cup of cream cheese • 1/3 cup of salsa fresca (tomato based salsa, made of fresh chopped tomatoes, onion, garlic, cilantro, and jalapenos… we buy ours in a big tub from Sam’s Club. This isn’t the really soupy kind you get in a jar alongside tortilla chips. You’ll find this in the refrigerated section of your supermarket (sometimes in the deli, sometimes by the produce)) • 6 flour tortillas (the little size) • 2 tbsp of sour cream • 1 bunch of cilantro, stems removed, coarsely chopped • handful of shredded Mexican cheese (we use the pre-shredded Mexican blend), for garnish Method 1. Poach your chicken. Place the chicken, the clove of garlic, and the ¼ onion in a pot, and just cover the contents with water. Add in salt. Bring water to a boil, then reduce to a simmer and cover, cooking for about 20 minutes (until chicken is cooked through). Remove chicken to bowl and let cool. 2. When chicken is cool to the touch, discard skin and remove chicken meat from bones. Shred chicken meat. 3. Add in cream cheese and salsa fresca to the shredded chicken and mix everything together well. 4. Heat oven to 200°F. 5. Pour your salsa verde into a large pan, and set heat to low. Heat a second pan over high heat, and add one tbsp of oil (something with a high smoke point like grapeseed oil) to the pan. Place a tortilla in the pan and let warm before flipping. Then place second tortilla on top of the first, in order to absorb some of the excess oil. Let the tortillas heat through and then flip again, removing the first tortilla after having done so. When the second tortilla is warmed through on its second side, remove from pan, add more oil, and continue the process until you’ve warmed all of your tortillas. 6. Dip your warmed tortillas into the salsa verde (coating both sides) and then place in an oven-safe glass dish. Place a heaping spoonful of your chicken mixture into the middle of the tortilla, and roll it up. Repeat with the remaining tortillas, then place the dish in the oven to keep warm while finishing the sauce. 7. Increase the heat in your salsa verde pan until it is simmering. Then add in the sour cream and the chopped onions, stirring everything well so everything is thoroughly combined. 8. Remove the enchiladas from the oven, and cover with sauce. Then sprinkle with cheese and cilantro. Serve immediately and enjoy! As you can see, this meal isn’t really time or labor intensive – the majority of the time simply comes from cooking the chicken and then waiting for it to cool. Of course, you could therefore make this meal even quicker and easier if you buy a precooked rotisserie chicken. Or consider this as a great way to use leftover chicken from a Sunday night roast or the like! Don’t worry if you wind up with extras – they keep just fine and heat up nicely in the microwave. 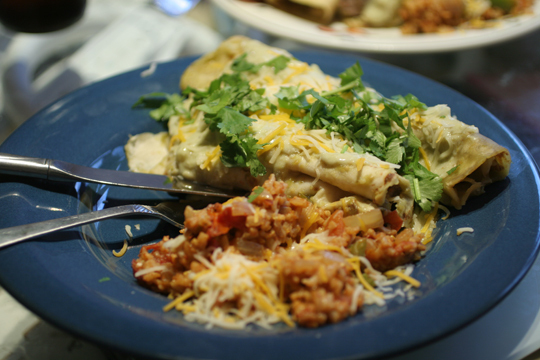 I served these enchiladas with a side of Mexican rice that I whipped up (I’ll share that recipe some other day), but they would also be nice alongside a little side salad. The cream cheese may not be totally kosher (or the Mexican version of kosher), but it really makes the dish nice and creamy and rich, and just a little more interesting than if you simply stuffed your tortillas with plain chicken. Simple to make, great flavor, and incredibly hearty. What more could you want when it comes to a weeknight dinner that’s just a little bit out of the ordinary? that looks delish (but slightly labor intensive). how about this? you whip it up and i’ll swing by and eat it!!! I just made this and it’s fantastic! Thanks for posting this, Steph!